The Hawthorne Community is coming together to re-imagine the school’s outdoor space. We believe this space can be more than a recess playground. It is a community gathering place, a place to connect with the outdoors, and a place for open-ended learning. More importantly, the process of envisioning, designing, and building a playground is more than a construction project. It is an opportunity to bring a school’s community together, to generate a sense of ownership, and create a rich platform for student learning and legacy. Grant writing is our most critical need right now. To make our vision a reality, we’ll need to raise an estimated $1 million over the next three years. Roll up your sleeves with other volunteers and help us meet our Seattle Department of Neighborhoods’ Community Partnership Fund grant's volunteer requirement. This is a great opportunity to work on a rewarding design process that’s also building community providing rich learning opportunities for our students. For more info about getting involved, contact Peter Schumacher at Schumacher.p.j@gmail.com. 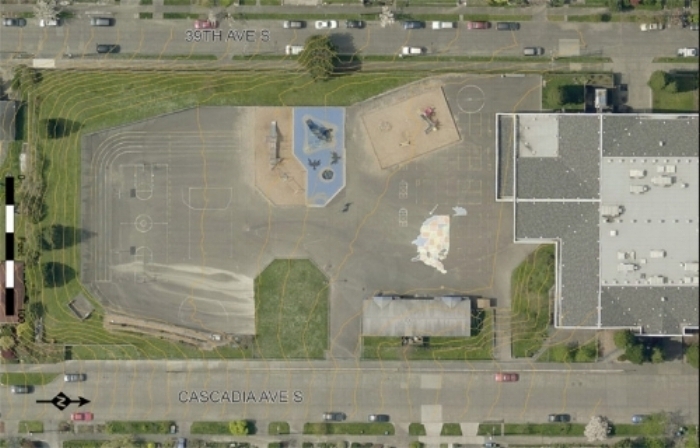 Seattle Public Schools has approved the master plan for our new playspace, which our design team refined with feedback from the community meetings, staff, and the school district. Click on the image below to see all the details, or walk around the playground to see the design striped onto the actual space! This is a big project that will take years to complete. We've developed a three-year phased construction plan, starting in fall 2018, when a new natural play area will replace a large section of the asphalt in the southwest corner. We'll add over 25 trees and native plantings around the perimeter of the site. Please join us to kick off phase one at a community planting weekend in fall 2018. Stay tuned for more details. Over 170 students, parents, and neighbors joined us for the March 29th meeting. The students presented their amazing design work and hand-built models, and the designers reviewed their work incorporating the community and student's feedback into 3 design options for the site. Turnout was great at the first of three community meetings we're holding to gather ideas for our new playground. More than 140 showed up! Hawthorne is a Creative Approach School that provides students with Project Based Learning opportunities aligned to academic standards through our STEAM Program (Science, Technology, Engineering, Arts, and Mathematics). This project has provided a tremendous platform for STEAM learning opportunity for the Hawthorne students. Students have had opportunity to take a direct role in the process working with professionals. Over 400 students had the opportunity this past school year to work on STEAM projects with Jason Medieros (spectabolis@yahoo.com) on STEAM-projects during and after school. We look forward to continuing more STEAM projects next school year: researching native planting and how their addition to the site will positively affect the local ecosystem, studying storm water on the site and how to reduce surface run-off, and an outdoor classroom design charette lead by the AIA Architects in School team. Friends of Hawthorne PTA has partnered with the Pomegranate Center and their partners at Outdoor Classroom Design, Earthplay Design, and Herrera Environmental Consultants to lead our community through a rewarding design process that has strengthened our community and provided rich learning opportunities for our students. This project is generously funded by the Seattle Department of Neighborhoods’ Community Partnership Fund, with support from Friends of Hawthorne PTA. The Neighborhood Matching Fund (NMF) program was created to provide matching dollars for neighborhood improvement, organizing, or projects that are developed and implemented by community members. Core to the fund is the community match, which requires awardees to match their award with contributions from the community (volunteer time, donated materials, donated professional services or cash). 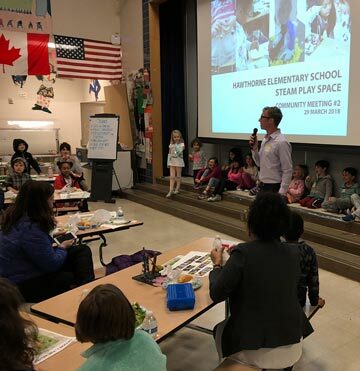 The City of Seattle granted $55,800 to Friends of Hawthorne PTA in 2017 to lead an extensive community engagement process to design a more welcoming and engaging exploration and play-space at Hawthorne Elementary School. We have committed to matching this grant with 1,400 hours of our time, mostly through the three community meetings. Typical Winter morning at the playground.